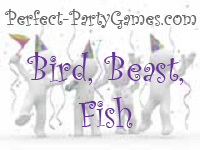 Summary: Bird, Beast, Fish is typically played near Thanksgiving, but can be played anytime. This is a game where you have to think fast. Everyone sits facing the leader. The leader points to one of the players and says either "Bird", "Beast" or "Fish." The chosen player must come up with the name of an animal that fits the category before the leader counts to ten. If the player does not respond in time, they are out. NO repeating, not even after a player is eliminated! The game continues until only one player remains. This game gets harder the more times you play it because there is STILL no repeating even if you start the game over with all the players. Winner: Last one left wins.